A gothic Victorian fantasy novel with secret societies, occult realms, and a kickass heroine, this book covers a lot of things. For one, it shows how stifling life used to be for women, making me immensely relieved that my family isn't marrying me off to some rich, repulsive fifty-year-old dude. I can't even fathom what it must've been like to have no say in your future. How the heck did girls live back then?! What really struck a chord in me, though, was...well, someone dies in this one and...nevermind I won't get into it. What is this, some kind of dear diary therapy session? You can put the tissues away. Just know that this is a terrific book, I couldn't put it down, and I may or may not have been crying on the inside the entire time. Books, they touch you and stuff. All the while, Gemma must fight shadowy monsters and discover her great and dangerous powers. It's like nothing I've ever read before. Historical fantasy novel with literary prose...how intriguing. Adding the rest of the trilogy to my library queue. P.S. Who else is stoked for BEA? Oh my, you must stop! TOO MANY BOOKS TO READ! :D Actually, this sounds awesome. 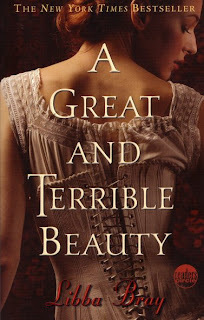 I love historical fiction and with a fantasy twist?...Delightful! Thank you for so effectively killing my productivity. I have this one on my shelf waiting to be read. :) I'm looking forward to reading it. Right now I'm reading Back Roads, and wow is it good! Great male ya pov! I have about five more blog friends' books I've purchased that I want to read before I move on. LOL, I bought a new books shelf, snuck it into my office and put it together without my husband seeing. Secret societies and occult stuff have always intrigued me, I definately want to read this book. Fixed marriages are all about controlling and extending the power. Knowledge is power :) Knowing is more power. Lesson learned: never forget in this grim world you have a heart.